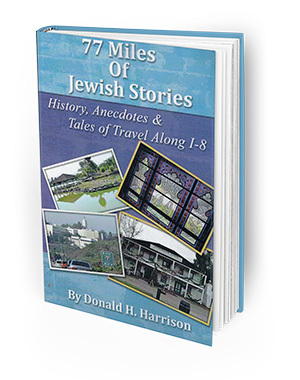 San Carlos resident Don Harrison believes there are Jewish stories everywhere. 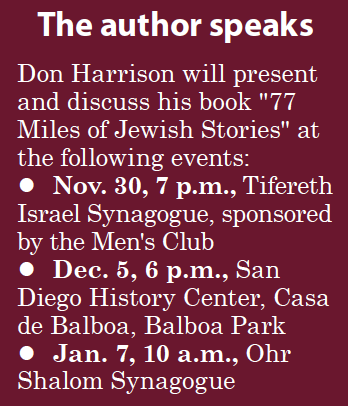 Writing about San Diego’s Jewish community is something Harrison has done since 1985, as editor and publisher of San Diego Jewish World. Many of the stories in the book appeared in San Diego Jewish World online in the past two years. 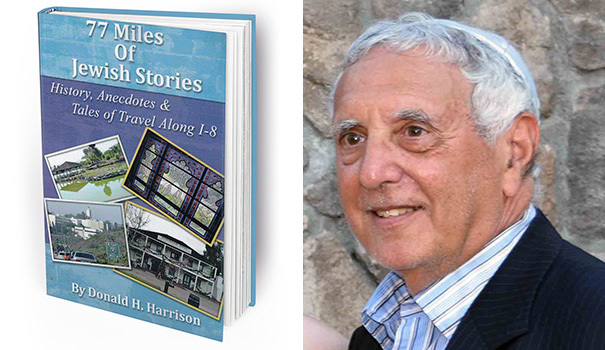 With an affinity for travel, Harrison is a self-described “wandering Jew. For “77 Miles,” Harrison drove around to get a sense of the areas of each exit along Interstate 8, leading to an almost accidental quality in the writing. Exit 2 — At the University of San Diego, Harrison learned of Colonel Irving Saloman, the first Jewish layperson to be knighted by the Catholic Church. “Pope Paul VI personally had approved [of the knighthood] because of Saloman’s open-heartedness,” Harrison said. Saloman donated large sums of money to USD, Point Loma Nazarene University and other universities. A lecture hall at USD and a theater at Point Loma Nazarene University were built in Saloman’s honor. Exit 2 — Harrison wrote about how Monsignor I. Brent Eagen, chancellor of the San Diego Diocese, asked Rabbi Wayne Dosick to lead an all-faith service every spring at University of San Diego. 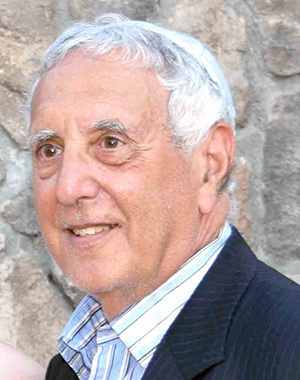 Eagen also invited Dosick to teach a class on Judaism, which he did for 17 years. Exit 8 — Harrison spoke with Dr. Paul Bernstein, Kaiser Permanente’s San Diego Regional Medical Director. Bernstein shared stories about his hero, the late Dr. Sidney Garfield, who was a Jewish surgeon. In 1933, Garfield started a 12-bed hospital in the Mojave Desert for 5,000 employees building an aqueduct to transport water from the Colorado River to Los Angeles. This was the first hospital in America with air conditioning for patients, not doctors. “It was unique, caring about how patients were feeling,” Bernstein said. Garfield was also a pioneer of the idea of pre-payment for medical care, preventative health care through health maintenance organizations and using technology to keep accurate medical records. Exit 9 — Harrison wrote a story about Del Cerro resident Saul Snyder — a world class tennis player in his 80s who won gold medals in the United States, Israel, and Croatia. Exit 10 — The College Avenue Center and Temple Emanu-El were the focus for stories from Exit 10. 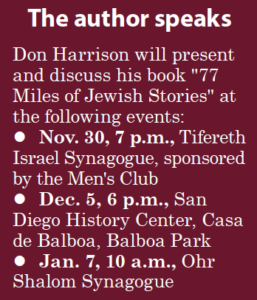 Harrison wrote about free classes offered to seniors through the San Diego Community College District there and how Jewish Family Services provide hot lunches at a nominal cost, followed by entertainment on Fridays. Exit 11 — One of the more intriguing stories in the book is the origin of DZ Akins Delicatessen, which Harrision recounts in his chapter about Exit 11. Debbie Epstein was attending University of California Los Angeles when her aunt told her to check out the Israeli butcher, Zvika Akin. Epstein ordered a kosher chicken, hoping for enough liver to make chopped liver. Akin offered to give her the extra liver if Epstein promised to bring him a sample of her chopped liver. She did and he loved it. Epstein disclosed her secret ingredient, which led to further disclosures resulting in dating, marriage, and starting DZ Akins Delicatessen. “I think of DZ Akins as the restaurant that ate San Diego because it grew and grew,” Harrison said. The famed delicatessen and breakfast restaurant first seated 48, then expanded to 100, then 150, so the Akins built a gift shop where patrons could browse before being seated. There were no profits in their first three months. But in the 1990s, the Restaurant Association awarded them “Best Breakfast.” Persistence and consistency were secrets to their success. Exit 14 — Dr. Ronald Goldberg from La Mesa Cardiac Center, was the first cardiologist to work in “interventional cardiology” — a term he coined. “She owed her great popularity to a phenomenal voice with a range from D to high C and a magnetic personality,” he said. — Sara Appel-Lennon is a freelance writer and former professional clown. Follow her at sara-appel-lennon.vpweb.com.